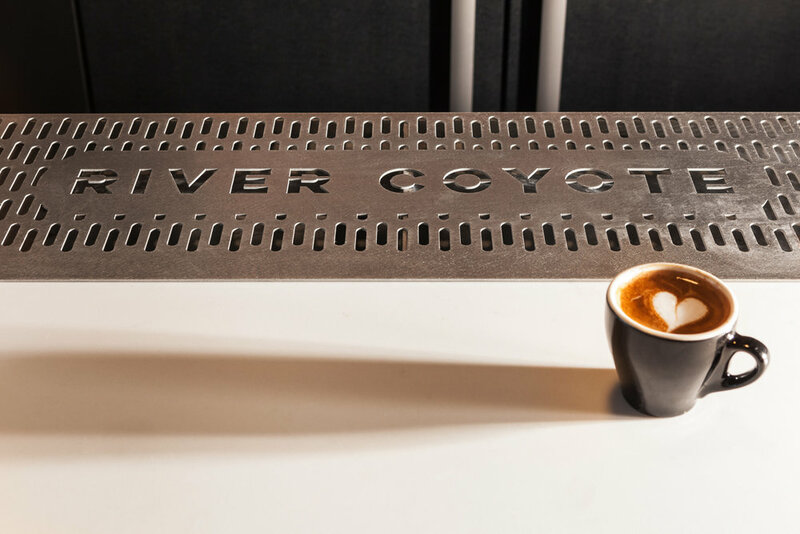 River Coyote is a wine and coffee bar on the Lower East Side. The 125-year-old space has a rustic atmosphere with an intentional industrial design featuring exposed brick walls, dark wood floors, and a minimalist marble and Macassar wood bar. "I need to be a part of the new, a part of what’s coming, but at the same time I don’t want to be a part of gentrification where we’re just targeting the million-dollar-condo owners". This Design/Build project revolves around the custom bar, designed for the all-day use of this unique concept with a separated dining and lounging area. The bar uses beans sourced from Brazil and roasted in Red Hook, until they’re finally brewed using a neato modbar system built into the counter with a bakery display case. The bar also has a custom-built triple fridge draught system, which offers 16 wines on tap meticulously chilled (eight whites and eight reds from around the world), in addition to stocking regional craft beers, cider, cold-brew and kombucha on draft. The dining and lounging area has a banquette nook opposite the marble-topped bar and a series of long tables for the restaurant which serves small plates by chef Alberto Parra during lunch and dinner. We used an integrated project delivery approach allowing us to complete the project on time and on budget.